YOUR PRICE: 10% Less Than Sage's Price - Call 1-800-259-4213 to order. Allday Consulting is an Authorized Reseller and have been selling and supporting Sage 50 Peachtree since 1985. We always sell the most current version of the software. Your order is shipped directly from Sage. Data Conversion is available! We offer conversions from an older version to newer, from DOS to Windows, or even from QuickBooks to Sage 50 Peachtree. 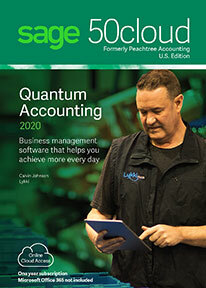 Sage 50 Peachtree Quantum enables you to manage all aspects of your business, including accounting, customers, inventory, services, jobs and employees - all in one centralized business management software solution. Designed to grow with your business, accommodating from 5 to 40 licensed, named users. If you manage multiple companies and budgets or need better insight into your numbers for strategic planning, then Sage Peachtree Premium Accounting is for you. It includes all of the features in Sage Peachtree Complete Accounting, plus advanced filtering on financial statements, progress billing, serialized inventory, and employee compensation tracking. Sage 50 Peachtree Distribution makes it easy for small distributors to automate their billing and payments, and streamline operations. Available with all the features of Sage 50 Peachtree Premium Accounting, it provides robust core accounting features plus powerful and flexible tools especially for distributors such as flexible pricing, advanced inventory management, UPS integration, and special reports. Sage 50 Peachtree Manufacturing provides all the core accounting features you need, plus powerful and flexible tools especially for manufacturing-related businesses. These tools include robust inventory management, improved control and tracking of assembly jobs, and industry-specific reports. Sage 50 Peachtree Nonprofit makes it easy for nonprofits to track where dollars go, so you can advance your mission. Available with all the features of Sage 50 Peachtree Premium Accounting, it provides built-in tools you need to fulfill nonprofit reporting, security and operational requirements. Sage Peachtree Complete Accounting delivers the efficiency your expanding business requires. This comprehensive solution lets you easily manage customers contacts and sales, customize inventory and vendor management, automate purchasing and shipping, track jobs and projects, and more. 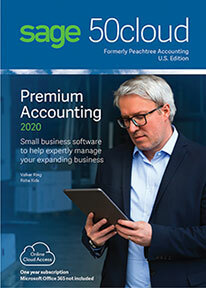 Sage 50 Peachtree Pro Accounting provides easy-to-use tools to help manage your expanding business needs. 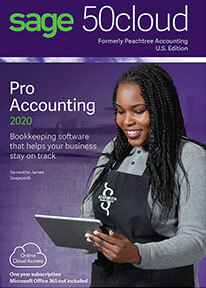 Based on real, double-entry accounting principles, it includes features such as inventory management, business analytics, payroll, and customizable reports.